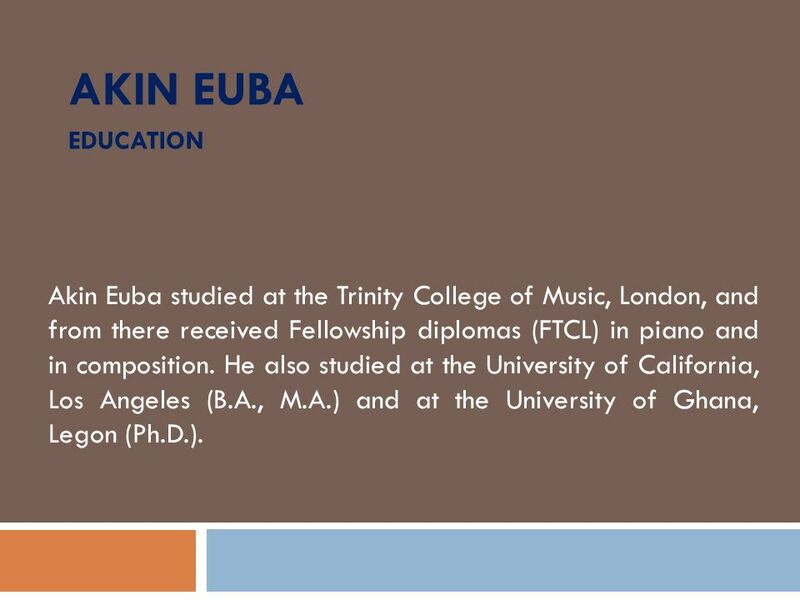 AKIN EUBA EDUCATION Akin Euba studied at the Trinity College of Music, London, and from there received Fellowship diplomas (FTCL) in piano and in composition. 1 AKIN EUBA EDUCATION Akin Euba studied at the Trinity College of Music, London, and from there received Fellowship diplomas (FTCL) in piano and in composition. He also studied at the University of California, Los Angeles (B.A., M.A.) and at the University of Ghana, Legon (Ph.D.). 2 Music teachers His composition teachers were Arnold Cooke, Roy Harris and Roy Travis (who supervised his M.A. 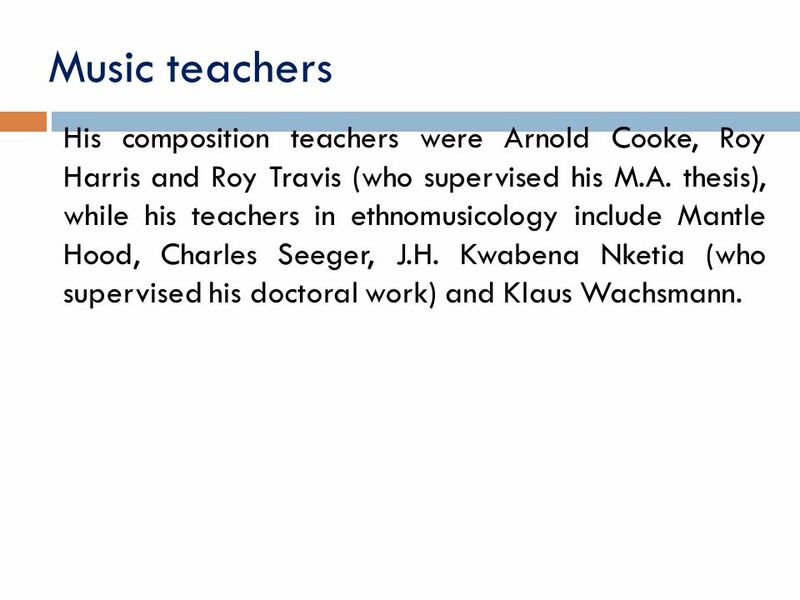 thesis), while his teachers in ethnomusicology include Mantle Hood, Charles Seeger, J.H. Kwabena Nketia (who supervised his doctoral work) and Klaus Wachsmann. 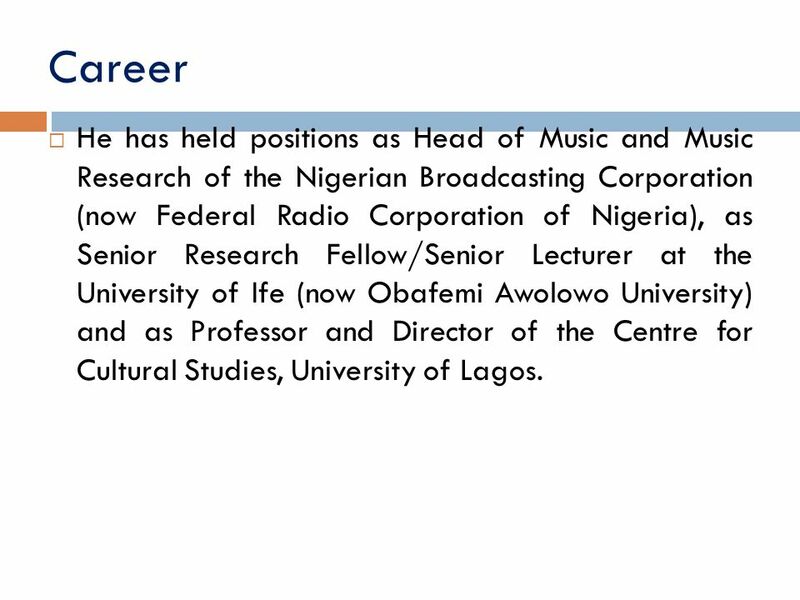 3 Career He has held positions as Head of Music and Music Research of the Nigerian Broadcasting Corporation (now Federal Radio Corporation of Nigeria), as Senior Research Fellow/Senior Lecturer at the University of Ife (now Obafemi Awolowo University) and as Professor and Director of the Centre for Cultural Studies, University of Lagos. 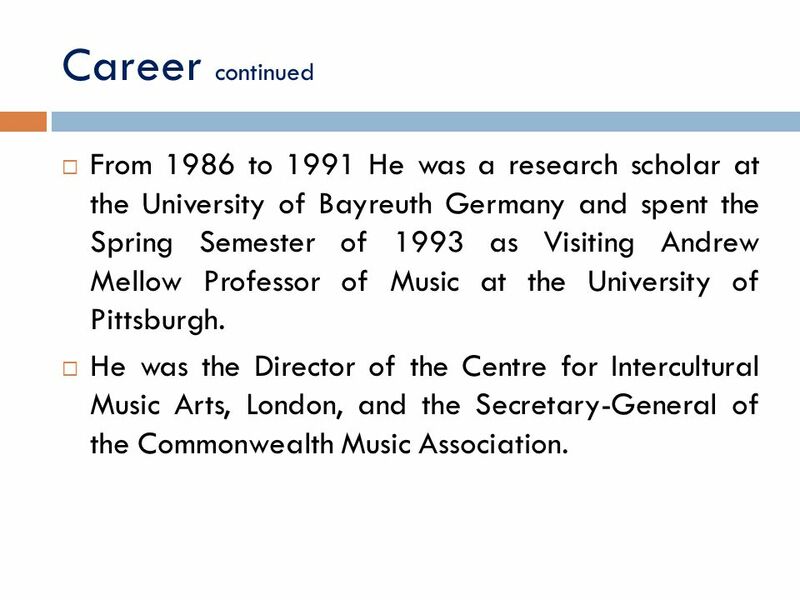 4 Career continued From 1986 to 1991 He was a research scholar at the University of Bayreuth Germany and spent the Spring Semester of 1993 as Visiting Andrew Mellow Professor of Music at the University of Pittsburgh. He was the Director of the Centre for Intercultural Music Arts, London, and the Secretary General of the Commonwealth Music Association. 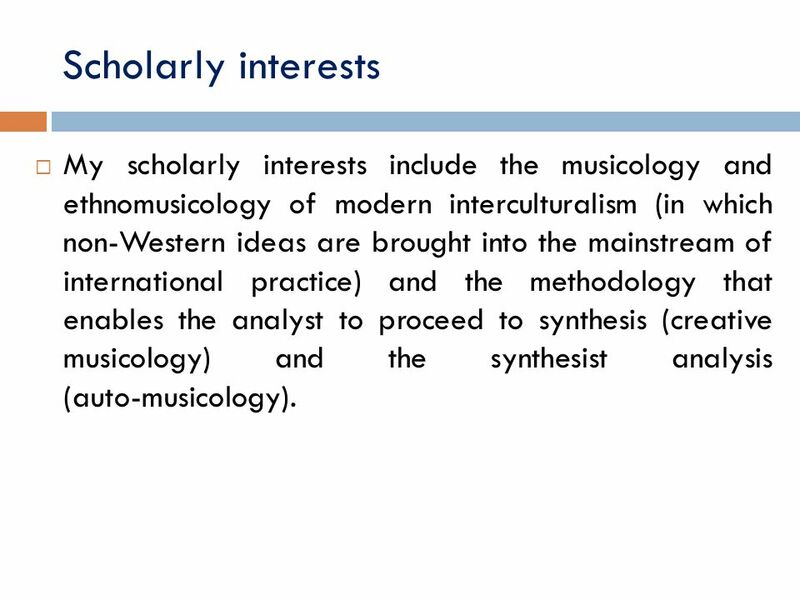 5 Scholarly interests My scholarly interests include the musicology and ethnomusicology of modern interculturalism (in which non Western ideas are brought into the mainstream of international practice) and the methodology that enables the analyst to proceed to synthesis (creative musicology) and the synthesist analysis (auto musicology). Download ppt "AKIN EUBA EDUCATION Akin Euba studied at the Trinity College of Music, London, and from there received Fellowship diplomas (FTCL) in piano and in composition." Ayo Bankole ( ) came from a family of musicians. His grandfather and father were both church organists and his mother taught music at the Queen's. Joshua Uzoigwe studied music at the Guildhall School of Music and Drama, London. He later did post graduate work in ethnomusicology with John Blacking. Joseph Hanson Kwabena Nketia (b 1921 in Asante Mampong, Ghana) displayed exceptional talent and sensitivity to music during his studies at the Presbyterian. The Fellowship Toolbox Perspective from Fellowship Alumna J. Nwando Olayiwola, MD, MPH, FAAFP November 13, 2012. Historical Musicology The links between A-Level and Degree Level Music. NTT Senate Representation Questions to consider Data: NTT faculty titles, numbers, affiliations. Understanding big data… Interesting things I’ve discovered on my fellowship so far… Michelle Darlymple Endeavour Teacher Fellow. 6 Academic “Schools” Arts and Humanities Business Education and Professional Studies Theology and Philosophy Natural and Social Science Nursing. The Composers’ Forum of The Associated Colleges of the South funded by a grant from The Andrew W. Mellon Foundation. INTERNATIONALIZING JAMES MADISON UNIVERSITY A Day of Professional Development and Celebration.  NDSU English Graduate Programs Master of Arts Literature or Composition Emphasis Ph.D. in Rhetoric, Writing and Culture. Greetings from Barry Hunt, MPA, and his Health Care Finance Students Management 478, Spring 2009 Health Care Financial Management College of Business. 1 Nottingham Trent University Education for Global Success. ANOTHER VIEW OF LEADERSHIP 360 CHARLENE MAXEY-HARRIS UNIVERSITY OF NEBRASKA-LINCOLN LIBRARIES OCTOBER 23, 2012. Why study music? Music stimulates creativity, imagination and intuition and encourages and develops the expressive qualities of a child. It helps the. International non profit NGO, working in Afghanistan since 2002 Providing educational and informative entertainment for children Educational entertaining. Disability in Corporate Africa A Personal Experience Farida N. Bedwei.